This is in support of our very own 'tame racing driver' Chris Shackle who competes in this series. A few of us attended last year and had a great day. This year we also hope to have a BBQ at the event. Another Vette needs to go to this Ian, please book her in. No problems Peter. No need to book in as such with this event as it's a race meeting and we can all just turn up if we want to. Can sort our details nearer the time. Haven't been to any racing for a long time. Chris, I have sent you a pm, to see if you have access as yet to a provisional timetable, as i believe the action is spread over two days, ie, saturday and sunday. May well get a weekend ticket if this is the case. Put Rose and me down for this one! Hey Nige - if it does I'll bring some goldfish ! Heres the timetable for the event for those interested. I will be aiming to be there for the start at 9.00am, and will aim to park at Russell chicane. Has anyone had any further thoughts regarding the BBQ ? My own view is it may be more trouble than it's worth as there is only an hours lunch break and by the time it's all set up and cooking the racing will be on again. Maybe give it a miss and take a picnic, or raid the buger van ? 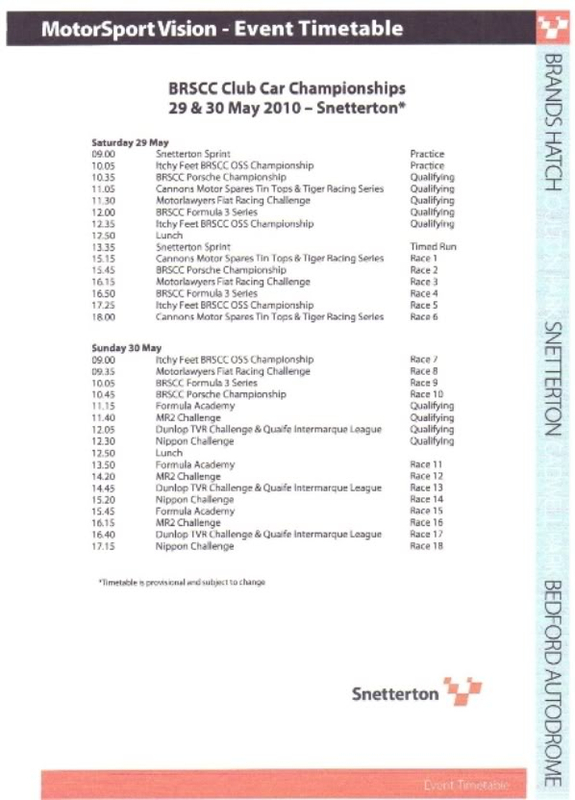 Just to add to what Ian's said, there is also a calander on the BRSCC website-http://www.brscc.co.uk/race-meetings/details/71-brscc-east-anglian-centre.htm . The BRSCC one is more likely to be updated first though. Other then that, hope to see you all there next week. Oh, and don't forget to fill up with fuel. WE hope to be there on the Sunday and yes we will be full up with FUEL! Well when we start at least! I must get the fuel sender and gauge sorted! It's now full, but it still reads just under full! I hope you've got those goldfish ready Colin. Giving the BBQ a miss, time to raid the burger vans I think. Oh no. Might not be a sports car trip then. Hopefully it won't be too bad. Hopefully they will get it wrong. States showers, clearing later on sunday.lets keep fingers crossed that the rain passes through on saturday night. Yeah Andy will be ok. Tesco have just opened a refurbished bright shiney new one around the corner.. errrr.. hang on.... ??? Anyway thanks for the tip on the Lamonta Nige. I'll bring some rubber ducks. Hopefully it will hold out but might not be a Tiv day. Now THIS is looking a little better, although still a bit nippy. I might be able to leave the ark at home and bring the Vette instead. I might be able to leave the ark at home andbring the Vette instead. ssshhh, don't look but it appears to be getting better! Oh, and I am officialy placing an imbargo on all shorts for Sunday. Cars on the Green being a prime example why! Other then that hope you all enjoy yourselfs! Quick update. Timetable has changed. Nothing major, but I think some races have been brought forward. See you all on sunday. Not sue what time will get in the circuit, as am giving a lad a spin in the Sag when i get there and having some photos taken with Kev`s racing Tuscan at the entrance. Probably seen the thread on PH about the lad that has a tumor and wants a ride in a TVR. But will be in before the racing starts. Here is the latest release of the timetable. Goddamit where did my last post end up then !!! It said "Hope we can still get £12 tickets on the gate. Doubt it's that popular". I'd better check tomorrow. If you are going on Sunday if so what time. I was going to get there nice and early actually Andy and make a reasonable day of it, so was going to try and get there for the first race or there abouts. That too early for you ? Suppose it would be about an 8 am start off.